The first week of our stay consisted of many introductions. Introductions to our site coordinator Catherine, to our project mentors Toni and Neelofer, to EPCC and King’s Buildings in general, to Edinburgh and of course to our projects. 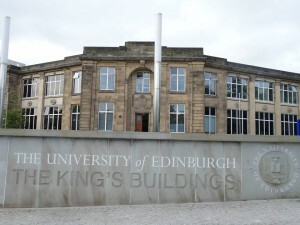 EPCC is located at the King’s Buildings (KB), not at the central campus of the University of Edinburgh. While our apartment is really close to the main campus, King’s Buildings is further away. Even when taking the bus, we still have to walk ten to fifteen minutes. Regarding the buses, almost all buses are double-decker and painted in white, burgundy red and gold. They look really fancy and in the beginning, I assumed those were for tourists. Nope, just regular buses. On our first day, we didn’t have our bus passes – called Ridacard – yet, so we had to buy a regular ticket and spent the whole ride just watching the city pass by. So much to discover! 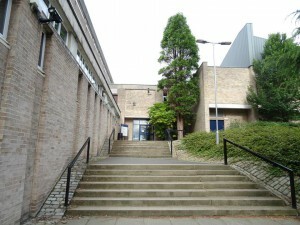 Finding KB and the James Clerk Maxwell Building (JCMB), home of EPCC, was quite easy, finding the right entrance was a bit more challenging though! In the end, we walked around half the building before finally finding our way into the building. Thanks to the instructions given at the reception, we managed to navigate inside the building and found Catherine’s office without getting lost. Success! 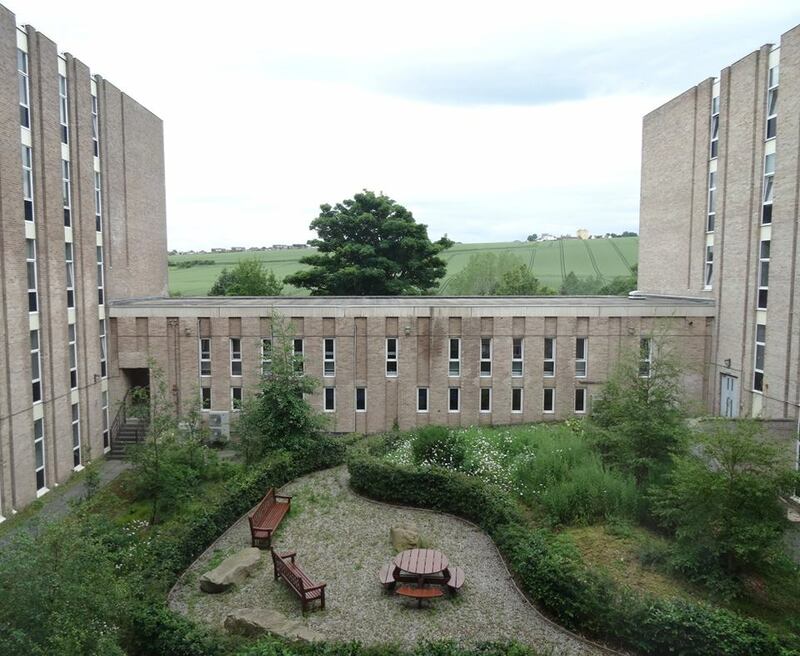 She had already prepared a folder for each for us, a writing pad, a pen, our visitor pass, a map of Edinburgh and lots of information – where to get food on campus, sports, medical care, sightseeing and so on. Afterwards, it was time to meet our project mentors. Ondrej and I work on the same project which results in us also having the same mentor, Toni. Since Toni will be absent from EPCC quite often, Neelofer acts as a second project mentor for us so that there’s always someone to answer our questions and give advice when we’re getting stuck. The rest of the day was reserved for getting to know each other, setting up our accounts and evaluating our knowledge and skills with a few simple tasks. The code we’ll be working on wasn’t written by a member of EPCC but by Albert and Ben from the University of Leeds. Naturally, communicating with them will be vital to the success of our projects! As a result we had to attend two telephone conferences on Tuesday: The weekly catch-up meeting with Leon and the other SoHPC participants and a first chat with the guys from Leeds. Just like the official SoHPC telco, it turned out a bit chaotic and of course, our understanding of the code so far was sketchy at best, but Albert and Ben really tried to explain the most important aspects to us! For the rest of the week, we focused on getting an overview of our projects and collecting questions for the next telco scheduled for Friday. Additional to our telco, we were also asked to present and discuss the week’s results with Toni and Neelofer each Friday. Another important appointment: Friday Buns! An EPCC tradition to meet each Friday afternoon and enjoy baked goods together. That’s definitely a tradition I like! If you don’t have a lot of scientific background, the title of my project “Implementing a MPI parallelisation in the Fluctuating Finite Element Analysis tool” can probably sound pretty intimidating but it’s actually not that difficult to get a rough idea about what I’m doing here. I’m trying to explain it as understandable as possible, of course, that involves a bit of simplification and some details are omitted. So, if you want to know more, check out the project page or just ask me! I’m starting with the “Fluctuating Finite Element Analysis tool”, short FFEA tool. Its model is a generalised Finite Element algorithm – a standard technique for numerically finding approximate solutions to boundary value problems for partial differential equations. It’s very useful for a vast range of different problems, especially simulations! In this case, it’s adapted for simulating large protein complexes within their cellular environment. Their are several other approaches for similar problems but FFEA has something that makes it special: It can simulate protein complexes at a scale between 10 and 500nm. This region is too small for conventional coarse-grained simulation techniques but too computationally expensive for atomistic molecular dynamics. FFEA operates between these extremes and could open up new regimes of soft matter physics and molecular biology to computer simulation. If you didn’t understand more than “some kind of biology simulation”, that’s fine too. My last biology lesson was in 10th grade and I’d definitely struggle to explain why the molecules behave like they do! 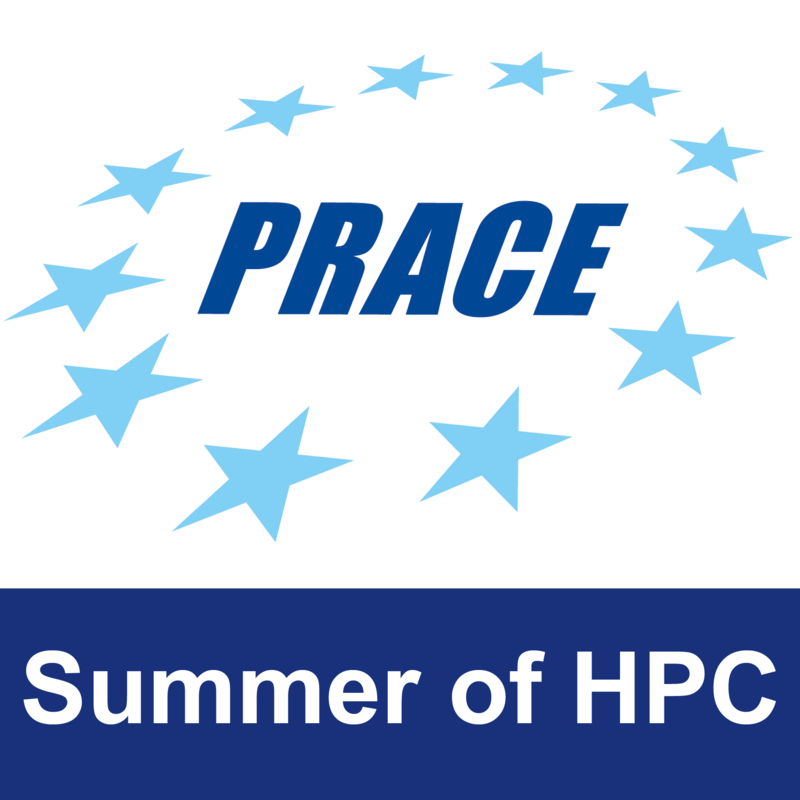 Still, I’m working on this project and everyone here is looking forward to the results of my work… But that’s one of the great things when working in HPC – it’s extremely interdisciplinary! It can be used for so many different research topics and unites people from all kinds of different backgrounds. No-one needs to know everything but you definitely learn something new with every single project you work on. 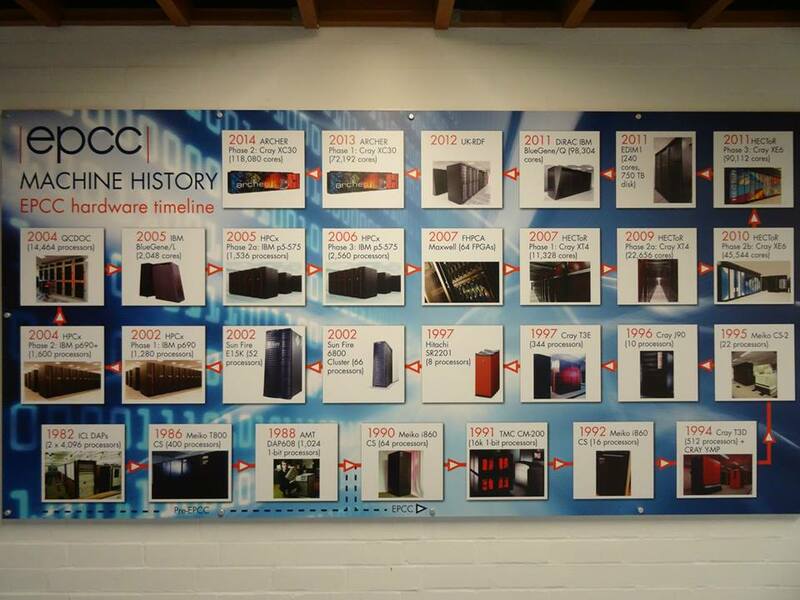 EPCC’s supercomputing history. ARCHER is in the top row as it’s the most recent system. As a programmer, I’ll focus on the “Implementing a MPI parallelisation” part of the project title. I already mentioned MPI in my summary of the training week but I’ll give a brief description again. MPI (meaning Message Passing Interface) is a standardized system for exchanging messages between the different processes of a parallel computer. 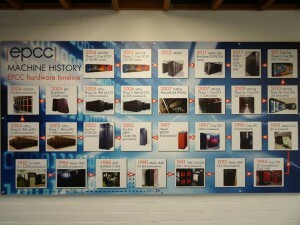 It can be used on almost all types of parallel computers and is especially useful for large-scale parallel applications because it can deal with distributed-memory systems. The current FFEA implementation only has an OpenMP parallelisation. Contrary to MPI, OpenMP is limited to shared-memory systems that are generally way smaller. Also, the OpenMP parallelisation doesn’t scale very well – it doesn’t make efficient use of its assigned resources. As a result, only very simple simulations are possible in a reasonable time. Obviously, those simulations are rarely interesting from a researcher’s point of view! By adding a MPI parallelisation, we want to change that and enable the usage of FFEA on large parallel systems such as ARCHER, the UK’s national supercomputer. This would allow far more complex (and realistic!) simulations… As you see, I have quite an important task! Scott Monument seen from the ground. Next stop was the Royal Mile. We even had a look at the castle but decided that it was way too crowded at this time. It would be better to return on another day. Instead, we just strolled down the Royal Mile towards the Palace of Holyroodhouse. It was there that we realised how diverse even the city centre is! The Royal Mile is part of Edinburgh’s Old Town (which is a UNESCO World Heritage Site together with New Town) so most of the buildings look really old (with a lot of touristy stuff going on). Well, the Scottish Parliament Building at Holyrood definitely doesn’t fit into this setting! It’s definitely understandable why it’s a pretty controversial building but there’s also lots of symbolism involved in the design. I might visit it again and participate in one of the free guided tours to learn about it. Not during the weekend though. By the time we reached the Parliament Building, I was getting a bit tired and asked for a short break. 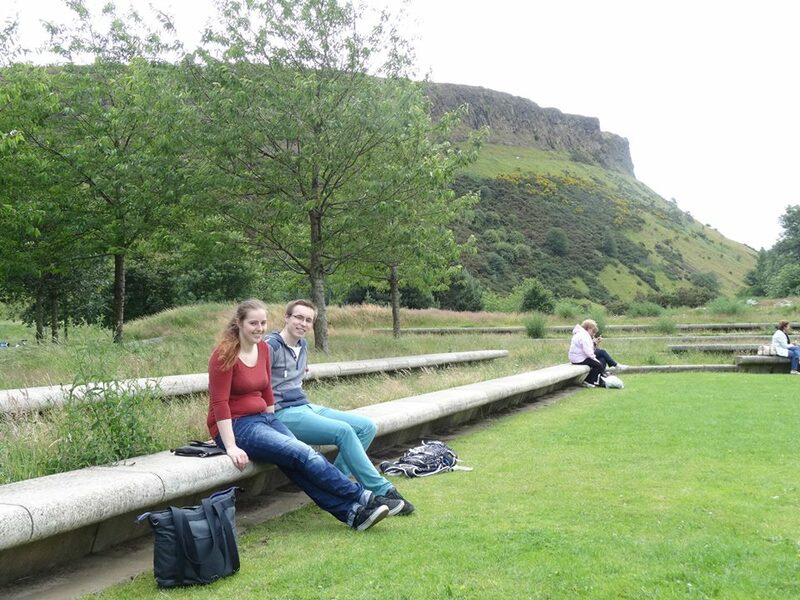 Conveniently, there’s a nice little park next to the Parliament Building with benches and artificial ponds and a great view facing Holyrood Park and Arthur’s Seat. After enjoying the rare sunshine for some time, we headed towards Holyroodhouse Palace and the Queen’s Gallery. Having a look at the admission prices, we decided to keep going. 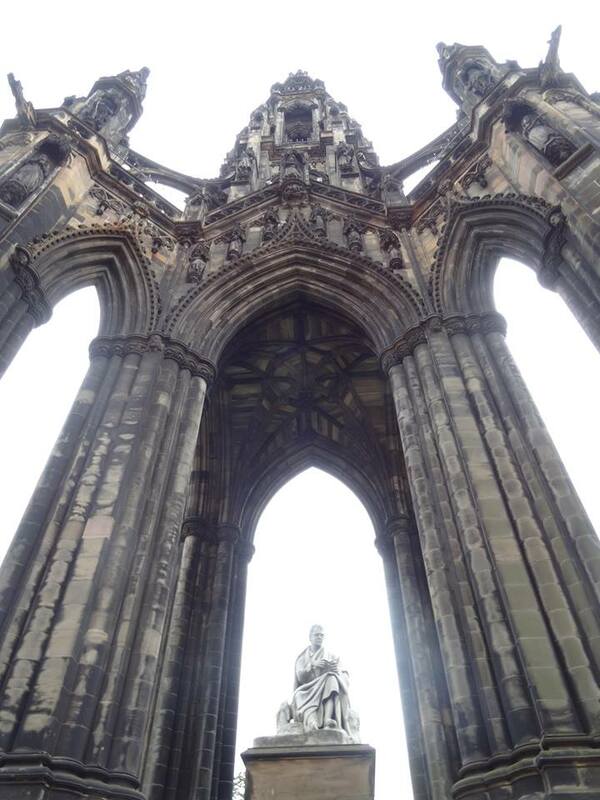 It was just too expensive for something that was not very high on our priority list – and there are lots of great sites free of admission in Edinburgh anyway! One of them is Calton Hill which feels a lot like the local monument collection. National Monument, Nelson Monument, Dugald Stewart Monument, Robert Burns Monument, Political Martyrs’ Monument and a few other iconic buildings (some of the monuments have an admission fee though). 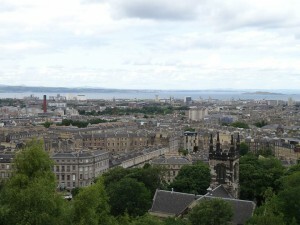 The hill also features a great view facing Edinburgh’s New Town with its well-preserved Georgian layout. Since we hadn’t eaten anything since breakfast, we bought lemonade and cake in a small cafe on the top of the hill and enjoyed the view. Apparently, others had the same thought as the hilltop was quite populated. There was even a bridal couple taking photos in front of the monuments! It was a really lovely (and very Scottish!) sight with the groom wearing traditional Scottish attire and the bride’s bouquet being white and blue. There are a few things I learned pretty soon during my stay here. Scottish people being very pround about being Scottish and everything related to Scotland is an obvious one. This applies to all aspects in life, from kilts still being popular formal attire to shopping groceries. It’s very common to see “Scottish…” and a huge Scottish flag on the labels and it doesn’t matter whether you buy raspberries, potatoes or butter. It’s always there. Also, thistles. Before I came here, I didn’t even know the English word “thistle” and most definitely hadn’t heard about it being the national emblem of Scotland. But here, I learned it in less than two days. 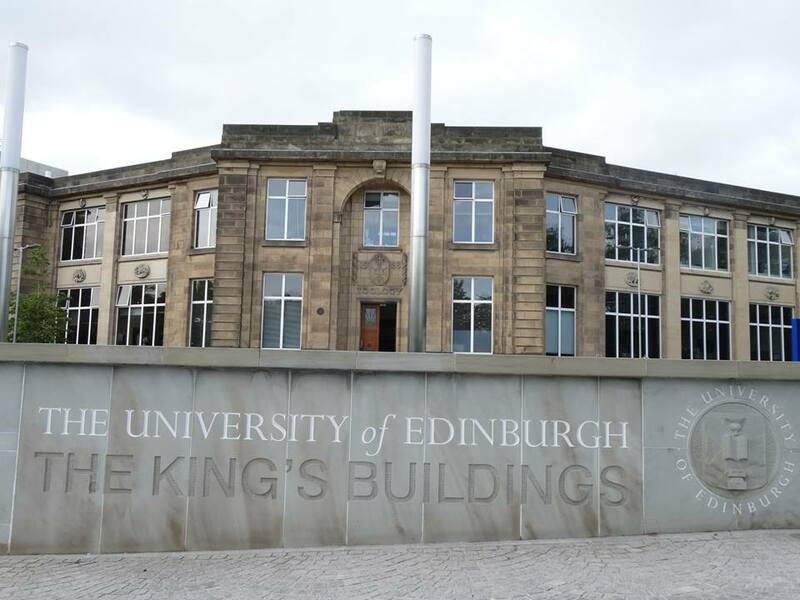 Thistles are everywhere, from the University of Edinburgh’s logo to newspapers to jewellery to cider brands! Food in general is a pretty special topic. I am still a bit disappointed with the local bread (apparently a typical German thing!) but also found some food items that I enjoy a lot, for example “tattie scones” which seem to be a popular breakfast item in Scotland. A German friend called the mere thought mistreatment of potatoes but well I like potatoes and almost all kinds of potato dishes in general! As another example, veggie haggis is not as weird as it sounds when you hear it for the first time – definitely not weirder than veggie schnitzel! However, the most important thing I learned is “Never leave the house without a jacket with a hood!” No matter how bright the morning seems, it’s likely that it’ll rain at some point during the day. And often, it happens when you just happen to be without shelter. The weather reports can’t keep up with the pace of the weather changes here in Edinburgh!